Navitron Renewable Energy and Sustainability Forum > SOLAR PHOTOVOLTAIC > Solar Photovoltaic Systems > Big re-work at Nowty Towers. Re: Big re-work at Nowty Towers. We had a perfect example of the SMA active power limiting yesterday. We were away for a few days and in the wall to wall sunshine we have been experiencing, batteries full, heat storage full, normally no where else for the leccy to go except the grid. 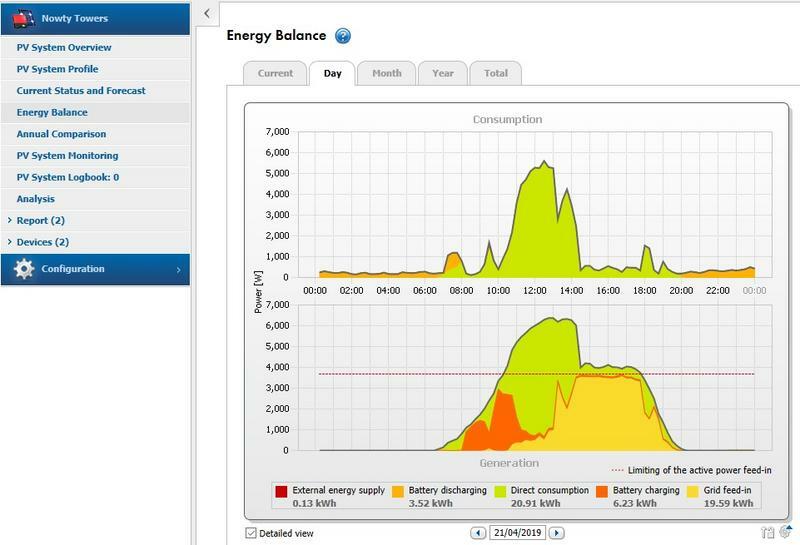 From 12:00 to 14:00 you can see that over 6kw was being generated (bottom graph) and increasing amounts being exported (the yellow bit) as batteries filled and heat storage was satisfied. Then as the export spikes upwards towards the 3.68kW export limit, probably as my Immersun diverter switched off, the active power limitation cuts in and throttles back my inverters and the generation drops from 6kW to just over 4kW. The export is kept below the 3.68kW export limit (red dotted line) and the active limitation finally is turned off at 6pm when the sun was no longer strong enough to generate enough to bust the 3.68kW limit. So system works as designed. Are you dumping the excess above 3.68kw export as heat? Yes, but in this case the heat stores are ALL full, therefore without active power limitation the system would export more than 3.68kW. Need to install and run some a/c or grow a cash crop? Can i ask what your heat storage method is? I think A/C installation is going to be inevitable in the near future but primarily for comfort purposes if last years summer heat becomes the norm. At least I will be able to run it carbon free. I suggested a/c to my wife a few years back and was shot down. We have it in Turkish house and it is excellent. As it stands with the pv install in Scotland we have large amounts of excess going forward so a cool Scottish Summer appeals. I may renegotiate as a cool nights sleep is priceless.